Little Cayman Escape est une villa unique de 3 chambres et 2 salles de bains (9 couchages) située sur la plage dans la charmante petite Caïman, la plus petite et la moins peuplée des îles Caïmans. Avec son architecture circulaire (comprenant une terrasse panoramique), son emplacement isolé et ses grandes fenêtres donnant sur les Caraïbes, un séjour à Little Cayman Escape ressemble un peu à un séjour dans un immense phare tropical. Pour une expérience décontractée ultime, cette villa dispose de 3 kayaks (deux simples et un tandem) pour explorer à loisir la mer cristalline et de deux vélos pour se déplacer dans la pittoresque île de Little Cayman (170 habitants). Lieu de légende parmi les plongeurs, Little Cayman possède un spectaculaire récif protégé et des épaves de navires au large. Enfilez votre équipement de plongée en apnée et dirigez-vous directement de la porte arrière de la villa à la plage, puis directement dans la mer pour plonger en apnée dans le récif juste devant vous. L'espace de vie à concept ouvert de Little Cayman Island Escape offre une vue dégagée sur Little Cayman, avec son sable blanc et sa mer couleur de plumes de paon. Dans cet espace commun, vous pourrez dîner, vous détendre sur un confortable mobilier inspiré d'une île et cuisiner dans la cuisine gastronomique extrêmement bien équipée avec ses appareils en acier inoxydable et son immense îlot de granit. Tous, bien sûr, en pleine vue d'un paradis tropical Technicolor. Les arrangements de couchage comprennent deux chambres de taille normale avec des lits queen size et une troisième chambre avec trois lits superposés de taille jumeaux et un lit superposé de taille normale. Malgré l’isolement de la maison, de nombreuses technologies vous permettent de rester connecté. Vérifiez vos courriels en utilisant le Wi-Fi de toute la maison, appelez les États-Unis à l'aide du Magic Jack, écoutez de la musique en stéréo ou regardez un film sur votre système de cinéma à domicile. Ce condo est autorisé par le Département du Tourisme. Il a subi des inspections des Départements du Tourisme, le Feu, Santé et Environnement de sorte que vous pouvez être assuré que cette propriété répond aux normes élevées de tous les trois départements et est une propriété légalement autorisé. The house was fantastic! It had amazing views and was the perfect peaceful getaway. It was well stocked from towels to kitchen items. It was very well maintained. We can't wait to return! The house has everything you could need in the kitchen. We added ice trays to the freezer as the refrigerator does not make ice and we forgot to buy ice at the store. The rooms are nicely appointed with plenty of dresser and closet space. I would have liked a softer bed but we solved the issue with sleeping on the comforter instead of under! What a beautiful private beach to relax and get away. We watched turtles feed daily and even saw lemon sharks. We never really encountered many bugs but at dusk you can get bit by the tiny no see um bugs. We rented a scooter and it's a 22 minute scooter ride one way to the grocery store going about 35 mph. A car would be much easier but the scooter was pretty fun. Bruce from Scootin Scooters will drop one right off at the house for you! We used the bikes several times as well to bike to point of sand. Make sure to hit the museum and also the visitor center. The view from the upper deck of the visitor center is a nice way to see the birds. Quick wifi throughout the house and down onto the beach. We never did watch the TV. It was nice the house had a phone if you needed to call somewhere on the island. They had shampoo, conditioner and soap in all bathrooms and plenty of beach and regular towels. There is an outdoor shower but it's not really private and only has cold water. I guess it's more of a rinse off station. We've done several VRBO houses and this one was pretty stocked with everything you would need. Great snorkeling right out front of the house as well. Thank you Terry! Thank you for your review of Little Cayman Escape. We are delighted that you both enjoyed your stay in this lovely beachfront cottage. It really is a spectacular location, and the snorkeling is breath-taking. We do hope that you will visit us again soon for another vacation in the near future. Thank you for your review of Little Cayman Escape. It is a very comfortable beachfront home, so your review is precise and succinct! We do hope that you will return for another vacation in the near future. Oh my what a pleasant surprise we had when we arrived at this villa.We knew it was nice but was even better than the pictures!!! It was so clean with all the amenities of home! Roomy common area in den and kitchen with windows all across overlooking the water. The kitchen was beautiful, very well stocked and even had some items you only have at home available which is especially good on such a small island with only one grocery. The baths were also well appointed! Nice size, convenient laundry with great washer and dryer! Loved the bunk room! The deck was huge and perfect for us!!! The beach was totally private and great for children because it's shallow. ( There is sea grass in water but it's soft and nothing is in it that would bother you!) We took a BIG blow up pool ( 6x9x3) , filled it and the kids played in it all week! ( We left it for the next family to use because it's a really good pool!) My husband and I are divers but the snorkeling right out from the shore was amazing! We couldn't believe all the marine animals we saw and the coral was amazing too!!! Our beds were comfortable ( I could take a little more padding) and all was clean with good storage space for our "stuff"! Loved having the area under the house with the picnic table, hammock, shower, bikes, canoes, etc. This was one of our favorite family trips and we've been a lot of places! We had 4 adults and 3 children (1, 4 and 6). Can't wait to go again!!!!! It was so relaxing!!! PS I do highly recommend water shoes because of the coral at the shore and the gravel under the house. But that coral makes for some good creative play! Thank you for your wonderful review of Little Cayman Escape. 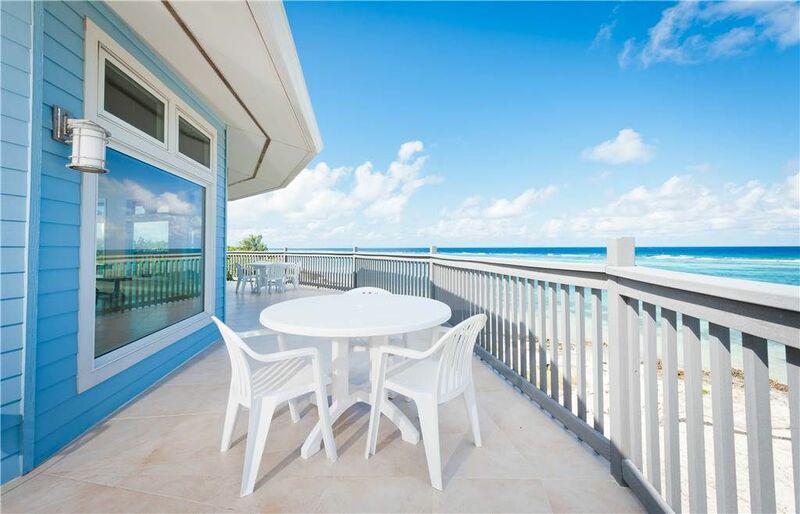 We are so pleased to hear that you and your family enjoyed your stay at this home in Little Cayman. We look forward to welcoming you back soon for another vacation! Little Cayman Escape was paradise. Gorgeous view right on the water. House was perfect. Snorkeled, kayaked and explored the beach right from the house. Saw an octopus just near the shore. You will need beach shoes though! The house had everything we needed for cooking and also had plenty of towels. I would definitely stay here again when we come back to Little Cayman. So happy to hear that you enjoyed your stay at Little Cayman Escape. We love Little Cayman! We hope to have you stay again soon. Please contact us directly for a repeaters discount! Stayed there with my wife and three adult kids. Very roomy, and perfectly able to handle our group. The bedrooms are very comfortable, the shared bathroom is more than adequate, and very nice. The Living room/kitchen area is also beautifully done, and the kitchen is very well equipped. We loved the expansive view of the ocean, and used the kayaks and bikes. It's a bit of a trip to the store, so a rental car might be advised. You can arrange one through the property manager, or at the store. It's a short bike ride to Sandy Point though. Little Cayman est la plus petite des trois îles qui composent les îles Caïmans. Cette île tranquille a fantastiques sites de plongée qui sont protégés parcs marins. Vous pouvez sauter sur la petite île appelée île Owen avec un pique-nique. Cycle autour de l'île ou à pied les belles plages. Ceci est un endroit romantique parfaite pour les jeunes mariés ou pour obtenir tout simplement échapper à votre journée bien remplie à la vie quotidienne. Laissez votre montre à la maison, vous êtes à l'heure de l'île. ADDTIONAL PERSONS INCUR A FEE OF $15.00 PER PERSON PER NIGHT.